Fixing large and very large formats (60X60 cm) and low porosity stone on facades. • The substrate must not excude humidity. • In hot and/or dry windy weather, the substrate should be protected with a tarpaulin and/or dampened and/or smaller areas only spread with adhesive. SUITABLE COVERINGS: Should comply with the NF DTU 52.2. • Extruded or pressed frost proof enamel tiles: 60 x 60 cm up to 6 m height 40 x 40 cm up to 28 m height. Fully vitrified tiles are limited to 2000 cm2. • Terra cotta tiles limited to 15 x 15 cm. • Terra cotta wall facings of formats less than 231 cm2. • Natural stone: Porosity > 2 % : • 60 x 60 cm up to 6 m, • 40 x 40 cm up to 28 m; Porosity 3600 cm2 in the case of concrete floors with built in hot/cold water pipes or electric radiant heated flooring. 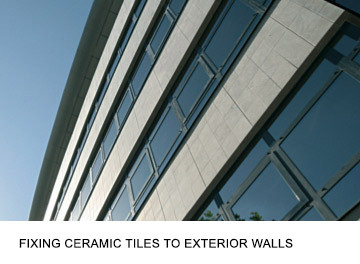 • CERMIFIX HP: refer to the Technical Data Sheets for the appropriate formats.• Use a U9 or E10 or E15 notched trowel depending on the format; see the product Technical Data Sheet.• Allow for inter-tile joints of at least 3 mm or 6 mm depending on the format;• TECHNICAL JOINTS:- control joints: they should comply with those of the embedding concrete.- peripheral joints: 3 mm minimum.• Finishing of joints 24 hours after fixing the tiles with CERMIJOINT COLOR -CERMIJOINT TX - It is recommended to use CERMIJOINT SOUPLE or CERMIJOINT TX admixed with CERMILATEX.• Renovation: see Advice Sheets n° 41 and 42.• Waterproofing: CERMITANCHE and CERMIPROOF under tile liquid damp proof protection systems (SEL). Apply a thin layer of adhesive (1 – 2 mm) to the back of the tiles. Regularly check that the adhesive is correctly transferred and squashed down and that there are no air spaces. Use a U 9 notched trowel (coverage 7 to 9 kg/m2, depending on the format). We recommend placing rigid spacers between the tiles, especially in the case of large formats. The nominal width of the joints should be at least 4 mm, except for mosaic tiling supplied in panels and terra cotta facings (minimum 6 mm). Allow for structural expansion joints, which should preferably be treated with prefabricated façade joints. Control joints: if CERMIJOINT SOUPLE is used for the inter-tile joints, control joints are not required. Abutment joints, outside corners and re-entrant angles should be treated with a compressible material. Wall parapets and the upper edges of the covering must be protected with suitable devices to ensure that rain water does not run onto the covering. We particularly recommend KITAJOINT jointing kit (cf. Technical data sheet) allows quick and rapid cleaning.